White Collar Fraud: Is Patrick Byrne, Overstock.com CEO, making false, misleading, and/or deceptive statements about the company’s financial issues? Is Patrick Byrne, Overstock.com CEO, making false, misleading, and/or deceptive statements about the company’s financial issues? During my days at Crazy Eddie, I hardly ever encountered tough detailed questioning by the Wall Street analysts covering its stock. Too often, the Wall Street analysts hoped to get chummy with Eddie Antar and me, to gain investment banking business, our attendance at their sponsored forums, or to gain coveted direct access to us. We believed that we knew how to play with the wants and needs of Wall Street analysts to corrode their professional skepticism. As criminals, we feared skepticism and cynicism from our external auditors, Wall Street analysts, journalists, and investors. We found that most people did not know how to ask good questions, whom to ask such questions to, and how to ask good follow up questions to our deceitful answers. In my previous post on my blog entitled “Questions the Securities and Exchange Commission may ask Patrick Byrne (CEO of Overstock.com) in its investigation of (not “on”) Overstock.com” I suggested certain questions that the Securities and Exchange Commission may want to consider asking Mr. Byrne about inventory and gross margin disclosures by Overstock.com. Afterwards, Tracy Coenen, Certified Public Accountant and Certified Fraud Examiner, had written a blog post entitled “Today’s earnings call for Overstock (OSTK)” and examined certain statements made by Patrick Byrne (CEO of Overstock.com) and Jason C. Lindsey (President of Overstock.com) at its recent earnings conference call for the 1st quarter ended March 31, 2007. Improvements? Pleased??? Come on now. Their definition of “improving” certainly must be a lot different from mine. Why? The company is doing horribly. Who in their right mind believes that such numbers represent an improvement in the business??? In a later post on her blog, entitled "Is Overstock.com misrepresenting inventory?" Tracy Coenen examined Overstock.com's inventory disclosures. At 12/31/05, Overstock reported $98.5 million of inventory, with a reserve of $5.2 million. The reserve was 5.3% of the total inventory. At 12/31/06, Overstock reported $26.9 million of inventory, with a reserve of $6.6 million. The reserve was 24.5% of the total inventory. So let’s get this straight… in terms of raw dollars, the obsolete (junk) inventory was greater at the end of 2006 than it was at the end of 2005. And as a percentage of total inventory, the obsolete (junk) inventory was over 4 times higher than 2005. On April 25, 2007, Overstock.com disclosed its first quarter ending March 31, 2007 financial results in a form 8-K filed with the Securities and Exchange Commission. That same day Overstock.com conducted an earnings conference call with certain Wall Street analysts. For the 4th quarter ended December 31, 2006, Overstock.com suffered negative gross margins on direct revenues. In addition, sales declined. They purported that they were getting rid of slow moving inventory as net inventory levels dropped from $68.8 million from the end of the 3rd quarter to $20.3 million at the end of the 4th quarter. During the 4th quarter, the company added significant relative amounts to reserves for Obsolete and Damaged Inventory from about 6.1% of gross inventory totals at the end of the 3rd quarter to about 24.5% of gross inventory at the end of the 4th quarter. The company suffered a net loss of about $45.6 million in its last quarter of the fiscal year..
We had our game plan. Really, we had our game plan as of Q1 last year of what was going to have to happen. We knew things were going to get really ugly and the company was going to have take medicine but that we could come out of it a far better company, and that medicine was going to be in the form of some expenses, it was going to be in the form of dumping a bunch of inventory as we figured out really how to take our inventory management to the next level -- all kinds of things. We knew it was going to get ugly. Maybe not as ugly as it got but we thought we would come out in the first quarter smelling like a rose operationally and this is exactly what we -- what I at least thought was going to happen in the first quarter. 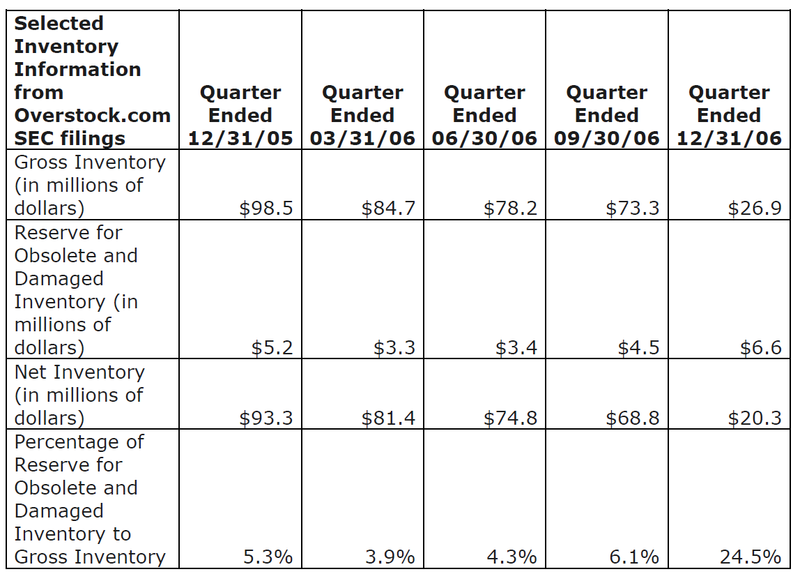 Why did Overstock.com wait until the 4th quarter of the fiscal year ended December 31, 2006 to take relatively high reserves against its inventory? See the table below (click on image to enlarge). 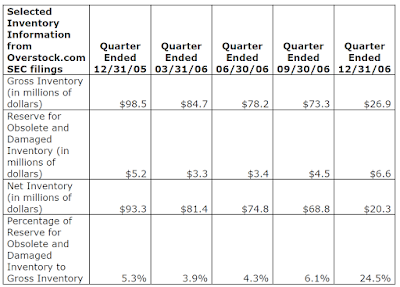 Please discuss the impact of Overstock.com's 4th quarter fiscal year 2006 inventory reserves on gross margins for the 1st quarter ended March 31, 2007 and future quarters. If that entire inventory on hand at the end of the 4th quarter of the fiscal year ended December 31, 2006, was sold at its original cost of $26,859,000 in later quarters, would you agree that Overstock.com would recognize gross margins of $6,585,000 in future accounting periods? Under such a circumstance, would gross margins recognized on that inventory (if sold at original cost) be about 24.5% (which is higher than historical gross margins for Overstock.com). Can you discuss in detail, how the use of inventory reserves contributes to Overstock.com’s purported improvement in its financial condition? How does the inventory reserves taken in the 4th quarter impact the purported improvements in gross margins during the first quarter of fiscal year 2007 and future quarters? Can you describe the specific financial impact of releasing those reserves? How does that “very healthy reserve against all of that inventory” help Overstock.com’s reported gross margins in future accounting periods? Well, regarding guidance, this is kind of a slippery slope and our official stance has always been we do not offer guidance, so my comment I guess first is I don’t want to go into the line items in the model and tell you what I think and don’t think about the different line items. What are Overstock's problems right now, and when will the company be profitable? I don't know. We have a plan this year that we should cross the billion-dollar mark. Put it this way: Amazon, at our stage, was losing $1.2 million a year in operations. It made up a phony accounting standard--pro forma. And when it reached pro forma breakeven, Wall Street set off fireworks. Mr. Lindsey purports being “comfortable” with the “consensus estimate” of “somewhere around $60 million” for operating losses for fiscal year 2007 a code word for giving earnings guidance. Question: Mr. Lindsey, didn’t you say the following comments during the 4th quarter earning conference call? I have seen what the consistent estimate, or the analysts’ consensus for us for 2007 is, and I know many of the analysts have models and it’s a difficult spot that they are in because they are trying to update their models without guidance. I just want to make a couple of comments, because maybe it will help the Q&A. Mr. Byrne when you said “This year, with a little luck, we should be an EBITDA-profitable year, so I'm kind of comfortable with that” were you giving earnings guidance? Mr. Byrne, didn’t you use “pro forma” accounting during this earnings conference call? Mr. Byrne, do you use pro-forma accounting when it suits your purpose on presenting the company in the best light? Rather than ask detailed critical questions to Overstock.com’s management, the Wall Street analysts threw softball questions and praised the latest quarter. Good quarter, good to see the improvement on the margin side. Mr. Kessler asked no detailed questions about the impact of previous reserves on current gross margins reported for the 1st quarter by Overstock.com. He did not ask questions about valuations of inventory in previous accounting periods. Great, and then a couple of other questions; where do you expect gross margins to go in the direct side over the next few quarters? Patrick M. Byrne: Jason, what do you want to say about core margins? Jason C. Lindsey: I am pleased with where they are at. Hopefully they can continue to sneak up but I do not anticipate anything, any huge stair steps from here. Really, we had our game plan as of Q1 last year of what was going to have to happen. We knew things were going to get really ugly and the company was going to have take medicine but that we could come out of it a far better company, and that medicine was going to be in the form of some expenses, it was going to be in the form of dumping a bunch of inventory as we figured. However, the percentage of Reserve for Obsolete and Damaged Inventory to Gross Inventory declined from the previous quarter. After the Securities and Exchange Commission starts its investigation of Overstock.com, the percentage of Reserve for Obsolete and Damaged Inventory to Gross Inventory begins to increase. However, the Percentage of Reserve for Obsolete and Damaged Inventory to Gross Inventory is below December 31, 2005 levels. The percentage of Reserve for Obsolete and Damaged Inventory to Gross Inventory continues to increase after the SEC began its investigation of Overstock.com. Overstock.com records a massive increase in the percentage of Reserve for Obsolete and Damaged Inventory to Gross Inventory. It appears that the caliber of many Wall Street analysts has not changed much since my days at Crazy Eddie. They seem to be more interested in serving their own personal agendas and pleasing management rather than serving the interests of the readers of their financial reports. Be careful about discussing Overstock.com’s results. You may get sued! Chief executives who are mounting legal defenses should be wary of playing dumb, warns Patrick Byrne, CEO of Overstock.com. Such a posture could insult a jury, he says. Maybe that's their only choice, but "Ebbers would have been better to plea bargain to 15 years," rather than "tick jurors off ... with a provocative defense," Byrne says. Perhaps, Mr. Byrne should follow his own advice. The Securities and Exchange Commission of (sorry Patrick, not on) Overstock.com continues after they dropped the Gradient probe. Gary Weiss Blog: Is Overstock.com’s Quarterly Delusion ‘Materially Misleading’?